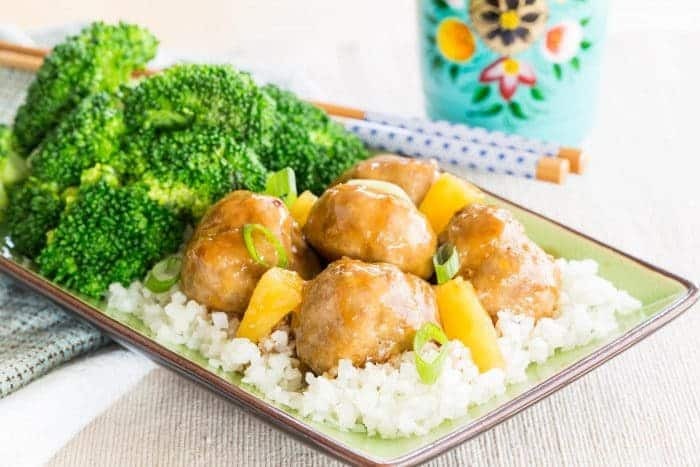 Pineapple Teriyaki Turkey Meatballs pack your favorite sweet and savory Asian-inspired flavors into one little bite. This turkey meatball recipe is perfect for party appetizers and delicious for a quick and easy dinner. 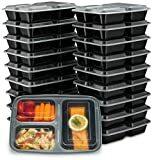 Plus the video shows you how to use this recipe for meal prep. Pack wholesome lunches for the week, with options for whole grain, gluten-free. It can even be one of your new favorite easy paleo recipes. It’s a new year and everyone is talking about their resolutions. Except those that don’t make resolutions. Of course, they are often talking about how they don’t make resolutions, but instead have intentions or goals or something else. So where do I stand with the “New Year, New You” resolution/intention/goal/etc.? Well, my “new me” is really about getting back to my “old me”. I, like many, missed a few more workouts, ate a few more cookies, and took an extra helping. Not surprisingly, I also let the busy season pull me away from my usual meal planning and mindfulness about my choices. Specifically, I am getting up earlier in the morning so I don’t make excuses for cutting my workout short. This also gives me a little time to myself to plan ahead for the day. I am back to my morning bowl of oatmeal instead of just a smoothie, which does help keep me fuller longer. That means less mid-morning snacking. I am trying to make a batch of Greek Yogurt Maple Dijon Salad Dressing and prep some salad fixin’s and roasted veggies to grab lunch quickly. And I’m planning ahead so I have all the ingredients and time to make nutritious dinners that are satisfying. This way I’m not grabbing extra servings or looking for an indulgent dessert in the evening (though Mango Lava Flow Smoothies or Pineapple Upside Down Cake for Two are a healthier way to satisfy that sweet tooth). 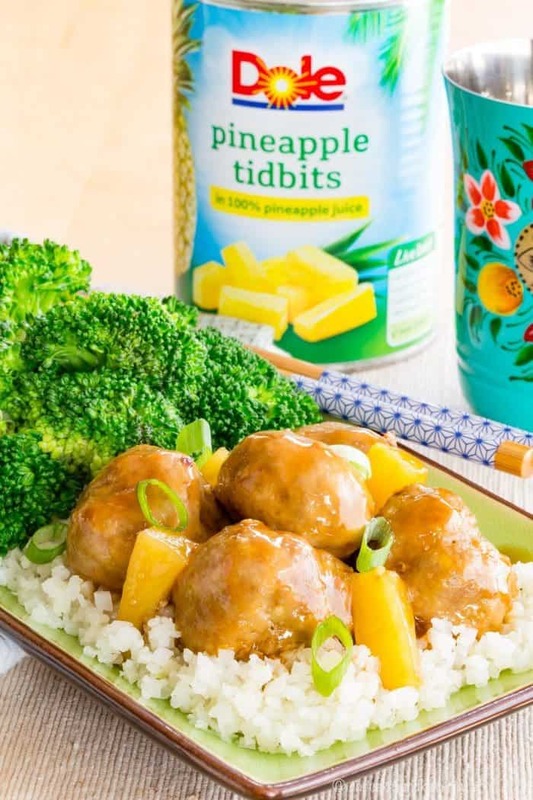 Pineapple Teriyaki Turkey Meatballs are a delicious way to stay on track while customizing to everyone’s tastes and preferences! 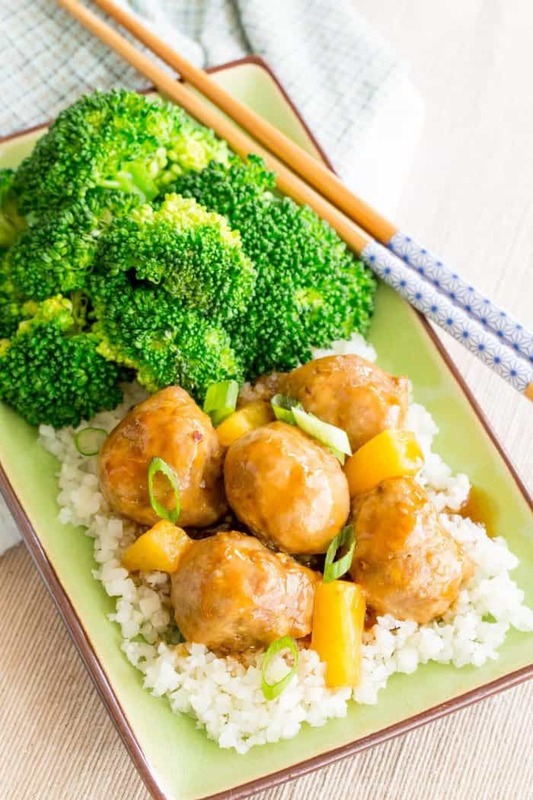 These teriyaki meatballs start with a basic mixture of ground turkey and egg. Season the turkey meatballs with ginger, garlic, and a pinch of red pepper flakes for a bit of Asian flair. 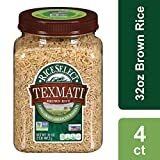 To bind them, you can stick with traditional bread crumbs, or use ground oatmeal (gluten-free, if needed) or almond meal. In a large bowl combine the ingredients, form balls, then bake them in the oven. 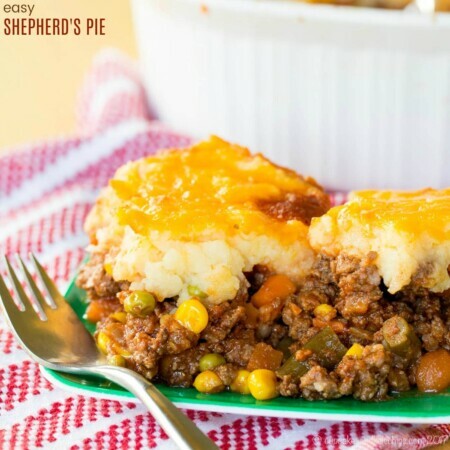 While they bake, a simple mixture of pantry ingredients is simmered together to make a sauce that you cook until it is slightly thickened. Again, a couple simple swaps can customize this for everyone. The base can be soy sauce, or you can use tamari if you have a gluten allergy. But there’s also the option of coconut aminos if you are following the paleo diet. And the mixture is thickened with your choice of corn starch or tapioca starch, based on your preference. 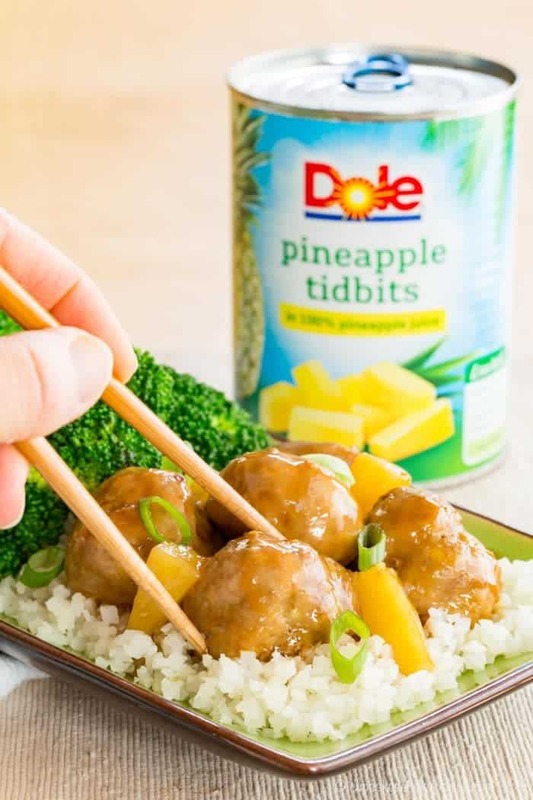 Open a can of Dole Canned Pineapple Tidbits in 100% Juice and pour some of that juice into your sauce to help sweeten it up a bit. Then some of the Pineapple Tidbits get mixed in when you add the meatballs. That’s what I love about products from Dole. I can always keep Dole products in my pantry or freezer to have on hand to add to healthy meals and snacks. And since the fruit is packed in 100% juice, I know that I’m adding an ingredient I can feel good about! 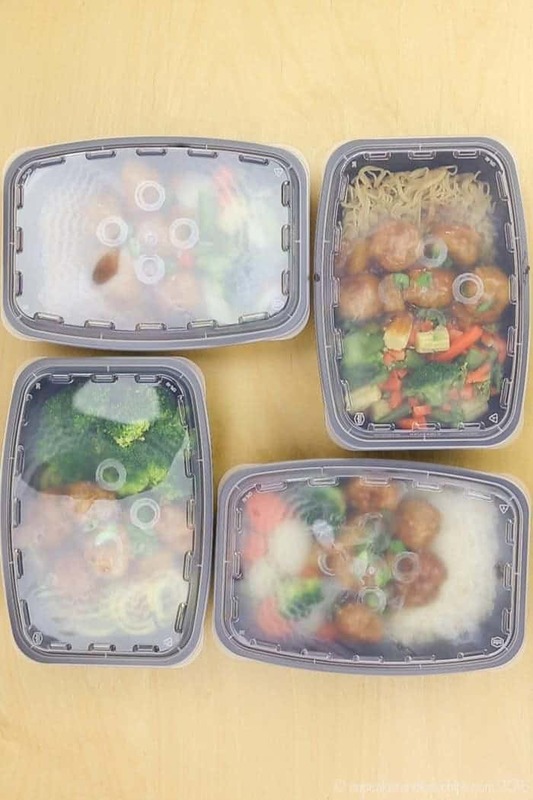 Make sure you’ve bought some meal prep containers. Standard ones work fine, or choose the kind with separate compartments. Steam some broccoli or sugar snap peas, or any other veggie of your choice. Another option is to take the super easy route of picking up a bag of frozen vegetables (I like to use an Asian blend). 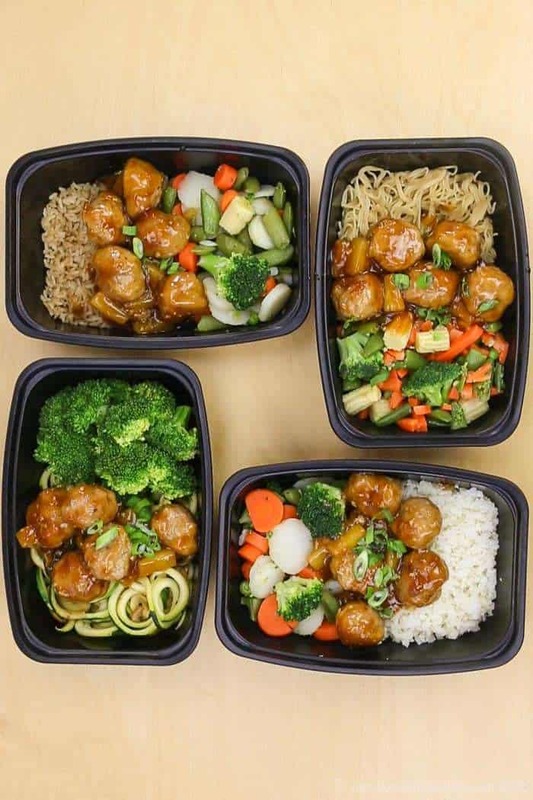 Then pack the veggies into containers with your choice of brown rice that you’ve cooked on the stove or in your Instant Pot (or grab these microwaveable pouches), ramen noodles (I like a gluten-free rice ramen I pick up at my local warehouse store), cauliflower rice, or zucchini noodles you’ve made with a spiralizer. 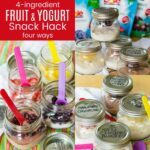 Pack four of the same or one of each and you have lunches for the week! Want to serve them as an appetizer? 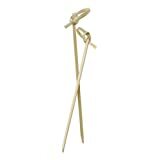 Just grab some cute bamboo toothpicks and put them in a bowl. My friends are here to help too. You can blend up this Strawberry Banana Smoothie from i heart naptime. Another meal prep option is Grilled Chicken and Pineapple Rice Bowls from RecipeGirl. 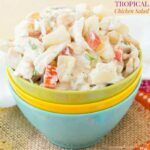 Or make a big Tropical Pineapple Salad from Chelsea’s Messy Apron. 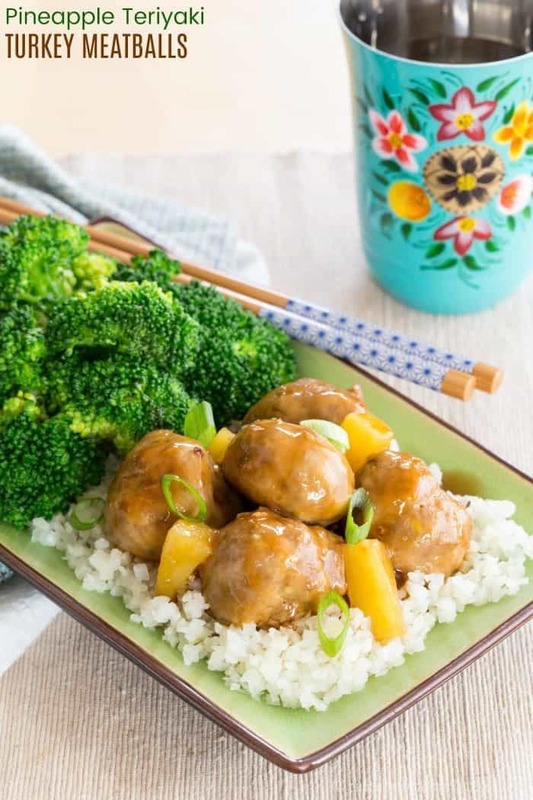 Infuse turkey meatballs with ginger and garlic, bake, and then simmer in an easy homemade teriyaki sauce. 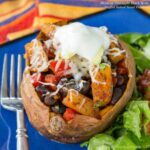 By making them yourself, you can adjust the ingredients based on your dietary needs or preferences, making the entire meal whole grain, gluten-free, or paleo. Choose between rice, ramen noodles, cauliflower rice, or zoodles for your sides to pack wholesome lunches to eat all week. Combine the ingredients in a bowl and gently combine with your hands until well mixed. Shape the mixture into 1 inch balls (you'll make about 20) and place on the prepared baking sheet. Bake for 15-18 minutes, or until firm and cooked through. In a skillet, whisk soy sauce or tamari, water, and cornstarch or tapioca starch together until smooth. Whisk in the honey, rice vinegar, pineapple juice, garlic, and ginger. Over medium heat, bring to a boil. Reduce heat and continue whisking to desired thickness. Add the meatballs and pineapple, and toss to coat the meatballs in the sauce, and once heated through, remove from the heat. 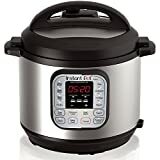 Serve over cooked rice, ramen noodles, cauliflower rice, or zucchini noodles and cooked vegetables, spooning on additional sauce and sprinkling with scallions, if desired. Sauce adapted from The Adventure Bite's Easy Teriyaki Sauce. You know my boys would be all about this! I think they’ll go crazy for them, Liz! I love anything with pineapples! 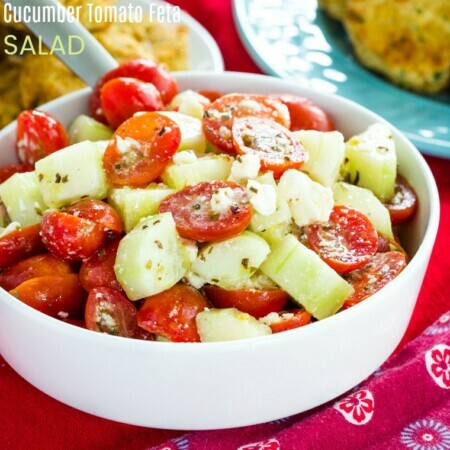 This is such a great meal for someone who is trying to eat more Paleo! 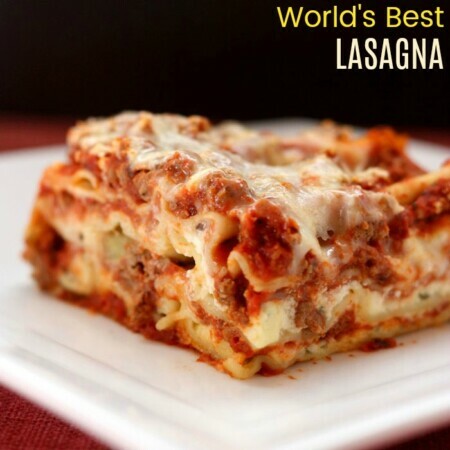 My kids love meatballs and I know they would love this if I made it for dinner! This healthy spin on meatballs is a perfect winter meal! My family will devour them! 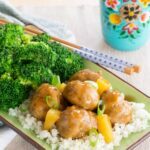 I’ll admit that I hardly ever made meatballs but they always look so good and I am tempted to try these! I hope you’ll give them a try, Julianne. You won’t be disappointed! Mmmm these turkey meatballs sound amazing! I love the pineapple twist. Pineapple and Teryaki is my fav combo! I can’t wait to try these meatballs out for dinner! 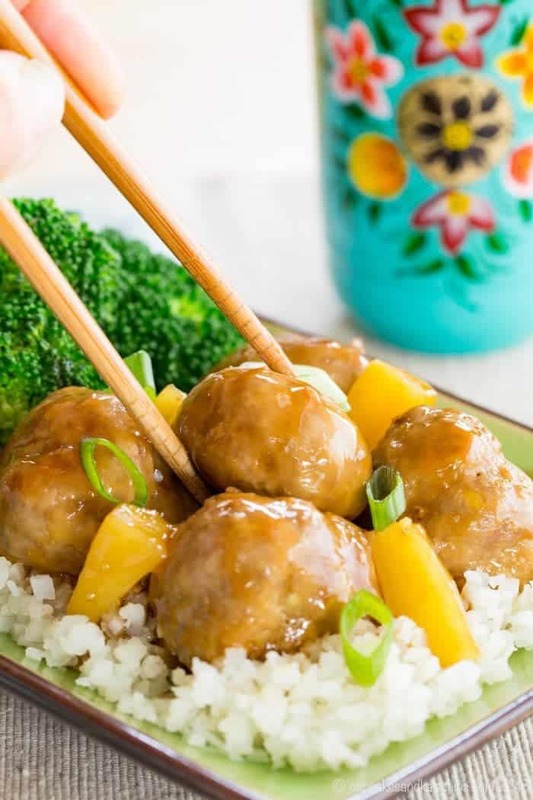 We love meatballs and these are a great twist on a family favorite! This is exactly the easy dinner that I need. I believe my teenager will eat ALL the meatballs, so I might have to double it so my husband and I actually get some! Looks fantastic! This is such a bright and beautiful dish! I love the pineapple mixed in this. I have to try this out for my family. I hope you all love the recipe, Julia! Oh my you are making me hungry Brianne , my dad and mom will love this kind of meatballs. I am gonna try this looks so summery and spring at the same time . I bet the pineapple really make it taste even better. 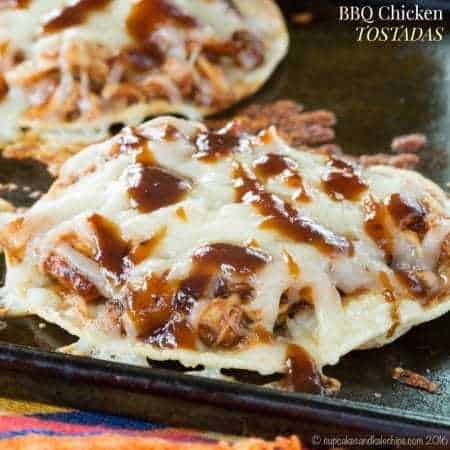 I pinned this recipe earlier this morning and for my grocery list I wrote down everything to make these! Can’t wait to try them. I’m so glad to hear that you will be trying the recipe, Richard. I hope you love the meatballs!